Sky 3D TV channel launches today | What Hi-Fi? Available at no extra charge to all Sky+HD customers with Sky's top TV package – and of course a 3D TV – Sky promises a variety of content, including an average of three live sports events each week. The channel kicks off with live 3D coverage of the Ryder Cup from Friday 1st to Sunday 3rd October. This will be followed by football, including the Manchester, Merseyside and north London derbies in October and November. Boxing fans will be able to feel every punch of the David Haye vs Audley Harrison fight thanks to Sky 3D, while there will be rugby union internationals to look forward to in November. But it's not just sport that gets the 3D treatment, movies such as Ice Age: Dawn of the Dinosaurs, Monsters vs Aliens, Alice in Wonderland and Bolt, as well as pay-per-view offerings including A Christmas Carol. Also coming in 2011 will be all three Toy Story films in 3D, with Toy Story 3 3D available in pay-per-view and Toy Story 1 & 2 at no extra cost. So that's movies and sports covered. There'll also be documentaries such as Sir David Attenborough's Flying Monsters 3D, 3D Meerkats, Bugs! and a one-off special called 7 Wonders of the Solar System. 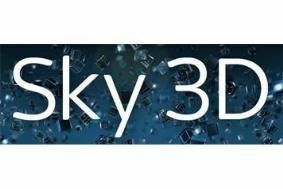 Sky 3D's Channel Director John Cassy says: “Sky 3D will totally change the way entertainment is viewed in homes across the country. We see 3D as ‘Event TV', an opportunity for people to share an incredible visual experience in their home, watching some of the biggest and best television available including; live sport, movies, entertainment and arts programmes. Join us on on Facebook.